Most of us spend the majority of our waking day at work, and the only record we have of that time and effort is a resume. We invest inordinate amounts of energy and emotion in our employment and memorialize that commitment in a document that is often out-of-date and incomplete. We strive to be the best we can be in our profession, craft or trade and keep track of our progress in a document that is limited to two pages and forced into a format dictated by employers. And when we do all of that—when we rely on a resume alone to manage our careers and celebrate our success—we sell ourselves short. So, what do I propose? Well, in my view, all of us should maintain two employment-related documents: a resume and something I call a career record. What’s the difference? Take a look below. • It’s normally written and/or updated only when you are actively looking for a job. • Its purpose is to sell you to an employer by describing what you’ve done in the past that might be useful to the organization in the future. • Writing it is about as much fun as getting a root canal. • It’s written continuously and reviewed quarterly. Think of it as a diary of your progress and your success in the world of work. • Its purposes are (1) to help you recognize and celebrate your career victories (i.e., your achievements at work) and (2) to determine if your career is in good shape or in need of an overhaul. In other words, a career record is written for you and describes what you’ve done for yourself. • Keeping a career record is a fulfilling and self-motivating experience. It enables you to pat yourself on the back regularly (or give yourself a pep talk, if that’s what is necessary) and set your sights on new goals at work that will lead you to additional career victories. Now, I know what you’re thinking: it’s hard enough to write a resume and keep it current, so why am I’m proposing that you double the effort? Because, in addition to being a personal pat on the back (which is, itself, the foundation of a healthy career), a career record can also make writing a resume infinitely easier. Here’s what I mean. In the past, recruiters were willing to accept a generic resume from job seekers, as long as you were applying for positions within the same industry and/or career field. They knew how hard it was to produce even a single version of that document, so all they asked was that you include a cover letter to highlighted those aspects of your record that were important for their particular opening. Today, unfortunately, that kind of flexibility is gone. Thanks to the Internet, recruiters are receiving hundreds, often thousands of resumes for a single opening. They simply don’t have the time to read between the lines and ferret out your qualifications for their opportunity. Moreover, recruiters know that your resume has been produced on a word processor where it can be easily and quickly modified. As a result, they now expect your resume, itself, to be tailored to the specific requirements of their opening and your cover letter to reinforce its key points. • One is to customize your generic resume. You simply add a little more detail to those points in the resume that are important to an opening and subtract detail from or delete altogether those points that aren’t important. While this approach can be relatively quick and easy, it is also likely to under-represent your qualifications. Instead of picking the best of your background for a position, you’re nipping and tucking at what’s immediately available. • The second is to tailor your resume from the bottom up. Admittedly, that would be a difficult and time-consuming task if you had to sit down and start from scratch. But you don’t. Your career record is a complete and up-to-date inventory of your skills, expertise and experience. It’s all of the best of you right there in one place. It enables you to pull out all of the factors that are most important to winning the job you want, and no less important, to incorporate those factors in your resume quickly and easily. 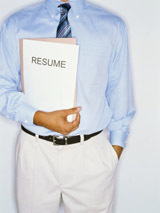 A resume remains the lingua franca of job search success in the world of work. For a resume to communicate your credentials effectively, however, it must be tailored to the specific requirements of a position vacancy. A career record enables you to accomplish that tailoring to your best advantage. And that alone would make it a worthwhile document. But, a career record does even more for you. It also provides a regular way for you to acknowledge your successes in the workplace—your career victories—and to direct your career toward those successes that are most meaningful to you.